San Diego - January 12, 2017 - Advanced Test Equipment Rentals (ATEC), a global leader in electronic equipment rentals with products from over 300 manufacturers, has announced that it now carries the newly released Teseq NSG 3150. A premiere manufacturer of comprehensive EMC systems for immunity and emissions testing, Teseq designed the NSG 3150 to exceed industry standards, reduce testing time and save precious lab space. The new NSG 3150 15kV Combination Wave Surge Generator enables users to conduct immunity tests in compliance with IEC/EN-61000-4-5. Built to excel in outdoor applications, the Teseq NSG 3150 can be used to test lightning, communication and energy distribution equipment, railways and protection systems and relays. At a height of just 7 U, it's the most compact 15kV surge testing solution in the world, while offering the safest 15kV connector on the market. The Teseq NSG 3150 was constructed with a high contrast 7" touch panel display and an integrated keyboard and thumbwheel for fast and efficient data entry. Standardized tests can be issued with just a few taps using the integrated Test Assistance (TA) function, making the Teseq NSG 3150 as easy to operate as the rest of the highly regarded Teseq 3000 series generators. "Teseq manufactures equipment that benefits users and aligns with our standard for quality and consistency, and we are pleased to carry the NSG 3150," said Gabe Alcala, Business Development Manager at ATEC. One such benefit of the Teseq NSG3150 is the 15kV combination wave, which enables its users to achieve higher amplitude testing, with the proven and modern NSG 3000 series platform. "This unique capability provides clients with the means to test at levels previously outside of their testing portfolio" Alcala explained. The Teseq NSG 3150 and its 690 VAC, 63 A, 3 phase coupling network are currently in stock and available with ISO 17025 Accredited Calibration for rent at ATEC. Orders placed today will be shipped tomorrow. 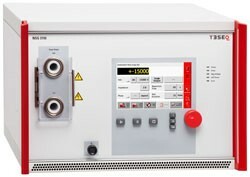 For more information on the Teseq NSG 3150 and other ATEC rentals, please visit www.atecorp.com/products/teseq-schaffner/3150. Since 1981, Advanced Test Equipment Rentals (ATEC), a leading high tech equipment rental company provides short and long-term rental solutions of analysis, inspection, measurement, monitoring, simulation, powering, certifying, and commissioning equipment to the aerospace, automotive, biomedical, communications, consumer electronics, defense, environmental, engineering, marine, power grid, transportation, and compliance testing companies. ATEC is ISO-9001 certified, and ISO 17025 Accredited in calibration. Visit ATEC at www.atecorp.com.